(Bloomberg Businessweek) -- Federal Reserve Chairman Jerome Powell has just finished his first year on the job—marking the fifth year of what could be called the Yellen-Powell Fed. Together with predecessor Janet Yellen, Powell has presided over the slowest rate-hiking cycle the U.S. has ever seen. Their patience might just deliver that most elusive of goals of central bankers: bringing a hot economy into a “soft landing,” tamping down nascent inflation while avoiding a recession. Inheriting a Fed that still had key interest rates near zero, Yellen began to raise them when economic data was strengthening—then paused and pledged restraint at the first sign of trouble. Powell has largely followed her lead. So far, so good. Inflation is hovering at about the Fed’s 2 percent goal, and 13 million Americans have joined the job market since Yellen took office in February 2014. The central bank has coaxed interest rates up to between 2.25 percent and 2.5 percent. And it’s managed to shrink the massive balance sheet of bonds it built up after the financial crisis without sending markets into a tailspin. Yet the strategy has taken fire from both sides. Yellen was regularly warned that raising interest rates too slowly risked spurring runaway increases in consumer prices. Throughout 2018, President Trump lambasted Powell for tightening too much. Many on Wall Street complained, too. The Fed changed tack in January, signaling a pause to rate increases and a willingness to reconsider the plan to allow asset holdings to steadily mature without reinvesting them. It was responding in part to slower global growth—not unlike the Yellen Fed’s yearlong pause when growth showed cracks in 2016. The complaint du jour has also shifted. Monetary policy commentators are now scandalized that Powell capitulated. Laird Landmann, co-director of fixed income at Los Angeles-based TCW Group, compared the Fed to an “average investor,” overreacting to recent disappointing economic data instead of sticking to the plans. “We fear that the Fed has given in too much to the market and its tantrums,” wrote Win Thin, global head of currency strategy at Brown Brothers Harriman & Co. in New York, in a note to clients. July will crown this U.S. economic expansion as the longest on record. If growth stays slow but positive, employees trickle back into jobs, and inflation remains contained, this could be the sort of cycle policymakers dream about. “There is a path to a soft landing, but it is a very narrow one,” says Seth Carpenter, chief U.S. economist at UBS Securities and a former senior monetary affairs official at the Fed. “The recent change in tone increases the chances, because it is far better to hike too little, then have to do more later.” The Fed will accomplish a rare feat if it stabilizes growth without major trouble. The central bank has stuck the landing exactly once in its 105 year history, in 1994 and 1995, under then-Chairman Alan Greenspan. Here’s why a repeat performance will be hard: The Fed raised interest rates four times last year, and the economy hasn’t yet fully felt the effects of those hikes. They could still curb activity just as the fiscal stimulus from Trump’s signature tax cuts fades. Add in shaky growth in China and Europe and ongoing trade tensions, and the outlook is dicey. 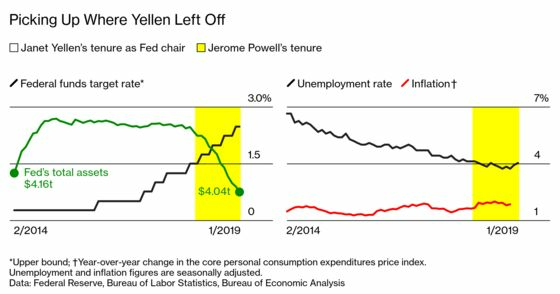 This points to one way Powell’s legacy could diverge from Yellen’s. Her main job was to lay the groundwork for normalization. Powell has to create a game plan for handling the next recession. Rates are still nowhere near as high as they were precrisis, so the central bank’s most important policy lever—cutting them—will have less economy-stimulating potency.